Typically served with hot chocolate, this easy-to-make holiday bread is a Mexican tradition. Combine yeast, water and 1 tsp. granulated sugar in small bowl. Warm 1/4 cup milk. Add to 1/4 cup (4 Tbsp.) butter in large bowl; stir until melted. Add 1-1/2 cups flour, remaining granulated sugar, salt, 2 eggs and yeast mixture; beat on low speed until blended. Gradually add 1-1/2 cups of the remaining flour; beat 2 to 3 min. or until mixture forms soft dough. Knead dough on lightly floured surface 5 min. Let rest 10 min. Roll out to 20x6-inch rectangle. Place chocolate pieces, about 3 inches apart, down centre of dough rectangle; fold dough lengthwise in half. Roll into 20-inch log; bring ends together to form ring. Place on parchment-covered baking sheet; cover with plastic wrap. Let rise in warm place 2 hours or until doubled in size. Meanwhile, mix remaining butter, flour, 60 g cream cheese, 1/2 cup icing sugar and nuts until blended. Divide into 5 pieces; roll each into 1-inch log. Wrap in plastic wrap. Refrigerate until ready to use. Heat oven to 350°F. Beat remaining egg; brush over dough. Top dough with nut logs; press gently into dough to secure. Bake 30 to 35 min. or until golden brown. Cool 10 min. Meanwhile, mix remaining cream cheese, milk and icing sugar until blended. Transfer bread to wire rack. 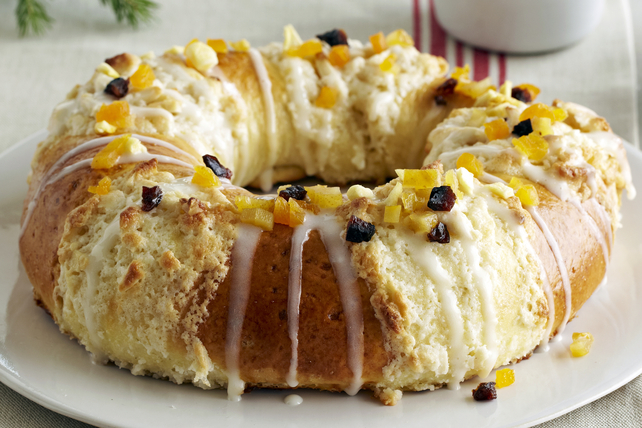 Drizzle with glaze; top with fruit. Three Kings Bread is a Mexican tradition that brings the family together for an after-dinner treat on January 6th of every year. The plastic wrap is used to cover the dough as it rises since it forms a tight seal which helps keep the dough moist.